For TV replacement, we used a TV box (3), that can output to an older CRT computer display (4). We were surprised that the Amplifier (below the display) was broken although it hadn’t been used at all and was working fine previously. So we took some mobile speakers from Logitech (5) and connected them directly to the TV box (whose built-in speakers are pretty bad). The TV box has a component video input at the front but the PS2 has a yellow composite video RCA jack so we only got a grayscale image when we connected it to the Y component (luma) plug. I remembered that we have an unused semi-broken VCR (2) without remote control (the cassette is ejected when trying to fast forward and other weird stuff is happening too). But it serves the purpose to be the mediator between the PS2 and the TV box. We plugged the PS2 composite video and audio jacks into a SCART adapter and connected it to the VCR input. The VCR can be connected to a TV either by using its SCART output or by tuning the TV to a “special channel” that the VCR inserts into the TV signal. Since the TV box has no SCART input, we did the latter. We did a re-scan on the TV box to find the new “special channel”. 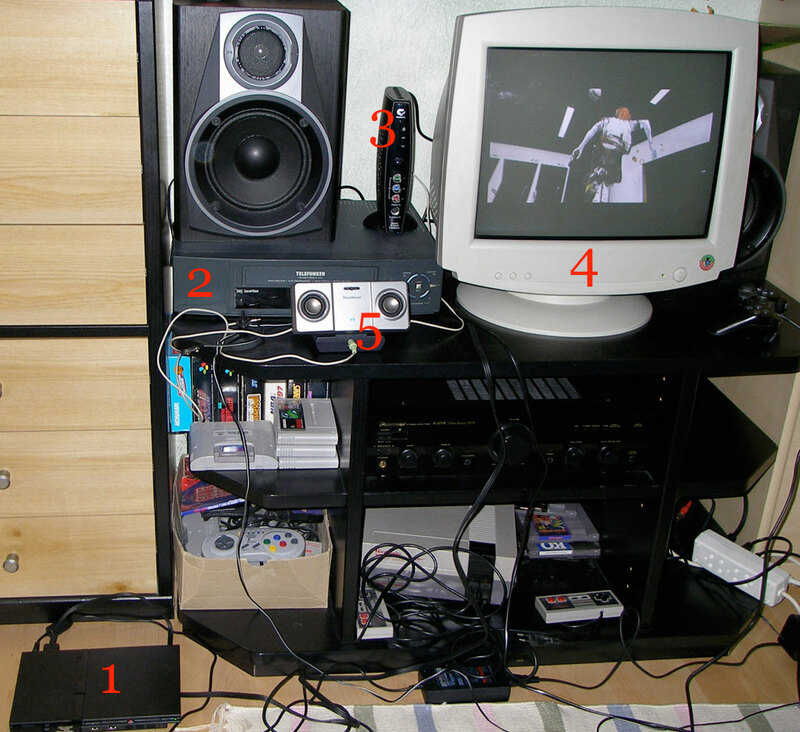 Turn on the CRT display, speaker, TV box, PS2 and VCR. Set the VCR’s input to Au2 to get the PS2’s video and audio which then is inserted into the TV signal as a new channel. Tune the TV box to channel 44 (that’s where the VCR channel has been found). Is there a better solution (without buying new stuff)?